Easter Sunday was spectacular at Journey! We had a packed house (or theater, if you want to be technical) and the energy and atmosphere was off the charts! Christ the Lord is Risen Today – this was kind of a mash-up of two different versions found on PraiseCharts.com. From version 1, we used the guitar lead line, and we used version 2 for the rest of the song, although we left out some of the vocal ad-libs. My Savior Lives by New Life Worship – This was a new one for us and it went over HUGE! The song was a hit and people were singing along right away. This one is definitely a keeper! Happy Day, Steve Fee’s Version, while there’s not much difference musically between the original version of the song and Steve Fee’s version, there’s a lot more energy in his recording and we used every ounce we could muster! Our God by Chris Tomlin – This song has become a powerful anthem at Journey and one that seemed very appropriate for Easter. 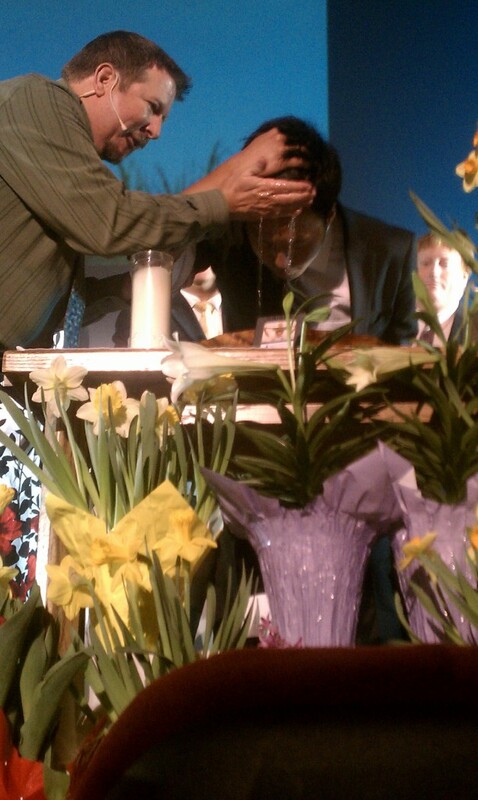 The Message, including a Baptism – a great thing to celebrate on Easter! All Because of Jesus by Steve Fee – A great followup to the message and a reminder of why we’re here. Let Creation Sing by Hillsong United – a great closer to a great worship service. Check out what other churches did on Easter over at TheWorshipCommunity.com. Were you at Journey on Sunday? I’d love to hear your thoughts! Leave a comment below and join in the discussion.